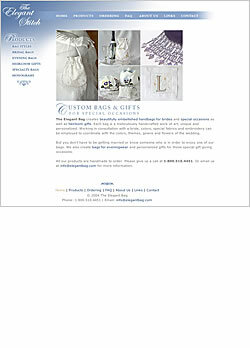 Designer Shannon Presson of The Elegant Stitch creates beautifully embellished handbags for brides and special occasions as well as heirloom gifts. Each piece is a meticulously handcrafted work of art, unique and personalized. The Web site showcases the company's products, serving as an online portfolio to attract prospective clients.